Grad School Status: I received my Master of Arts in Higher Education from UCLA in 2016. I am currently a second year PhD student in the higher education program at UCLA. Why did you want to become ASI’s Attorney General and what did you learn through that experience? 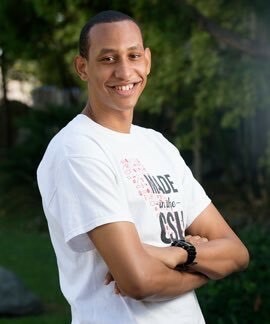 I wanted to become ASI Attorney General because I was passionate about serving CPP students, by ensuring that Student Government upheld our commitment to follow the by-laws and policies that governed our organization. From this experience, I learned how to write governing policies, advocate for students at a system and statewide level and participate in the shared governance of CPP. What did you accomplish as ASI’s Attorney General? During my term as ASI Attorney General, I was able to help accomplish updates to ASI’s Articles of Incorporation, by-laws and committee codes. I created and hosted the first ASI Council Compliance workshop, and I participated in the creation and implementation of the Student Success Fee. I also served on several university-wide committees. I was able to help inform students about the 2012 election and lead the ASI referendum efforts that took place during the election for the changes to the Student Opportunity Initiative. What do you think is the best thing about ASI and why is ASI important to you? The best thing about ASI is that it embodies CPP’s “learn by doing” philosophy. ASI Student Government is more than a position or a title. ASI is the opportunity for students to get to serve their fellow students through goal setting and attainment. This is important to me because I appreciated the opportunity I had to not only make a difference in ASI, but make a difference for the student experience on the Cal Poly Pomona campus. What did you learn at ASI that helped you prepare for life after graduation? What professional skills do you think are most important in any career? One of the biggest lessons that I took from ASI was understanding the importance of accountability. As a student leader, I had to hold myself accountable to meet the goals for our organization. Focusing on my own personal accountability kept me focused to accomplish challenges that I faced throughout the year. The most important skill that is needed for a career is organizational skills. In order to be most effective, one must be very organized in order to be prepared to meet the demands of a career. I define success as the positive impact that you can make for other people. When I succeed, I hope that my success has an impact on other people in order by making a difference or inspiring other people to want to make a difference. How did CPP’s learn-by-doing philosophy affect your academic journey? CPP’s learn by doing philosophy had a significant impact on my academic journey. As a graduate student, I channel my CPP academic experiences to make sure that I conduct research that can be applied to students in pursuit of their higher education. The application of knowledge is the reason why I am pursuing a career education. What is the best advice you have received and what advice do you have for CPP students? The best advice that I received was to “live in the moment.” There is a lot that happens during the college journey, so I encourage students to enjoy their time at Cal Poly Pomona. My years at CPP were so rewarding and there is always a rush to get out of college, but it is always humbling to take some time and live in the moment and embrace the great opportunity that we have to be pursuing an education at a world-class university. I consider my parents to be my role models. My parents’ dedication and hard work ethic inspire the work that I do. While at CPP, I was also fortunate to have some really great mentors who helped along my journey as a student. Academically, my faculty advisor, Dr. Renford Reese, was a great source of support during my time at Cal Poly Pomona. In ASI, the leadership team and ASI Student Government professional staff were the best support system during my time serving in student government. What is your most memorable Cal Poly Pomona experience? My most memorable CPP experience was participating in the Cal Poly Pomona Day at the LA County Fair. I was fortunate enough to participate in the annual parade while I was a student at CPP. I enjoyed the opportunity to come together with the campus community to celebrate Cal Poly pride. “The ultimate test of a man in not where he stands in moments of comfort and moments of convenience, but where he stands in moments of challenge and moments of controversy.” – Dr. Martin Luther King Jr.
Are you ready to get involved with ASI? Catch ASI Presents: The Student Experience on Thursday, Jan. 19 from noon to 1 p.m. in the Bronco Student Center, Ursa Major AB (BSC, Bldg. 35-2611AB) for more information on how you can jumpstart your involvement with ASI!